We’d love your help. Let us know what’s wrong with this preview of Hoot Owl, Master of Disguise by Sean Taylor. Hoot Owl is no ordinary owl – oh no! – he’s a master of disguise! And he will use his expert camouflage powers to trick his unsuspecting prey into succumbing to him! Tiny animals of the night ... beware! But, somehow, Hoot Owl's prey keeps escaping... Hmmm, perhaps he isn't quite as masterful as he believes. Will he ever succeed in catching himself some dinner? To ask other readers questions about Hoot Owl, Master of Disguise, please sign up. We loved the narrator, Rick Adamson. He really makes the story spark. in the cool of the night! but soon I will be eating it. The illustrations are cute and we loved the ending. Hoot Owl narrates his nighttime search for prey in cliched super-hero voice over as he spots one potential meal after another, always failing to feast upon the hapless animals due to his desire to lure them into the trap of his cunning disguises rather than swooping upon them in the standard owl manner. I had never seen a noir picture book before. Who, oh who is Hoot Owl, Master of Disguise? He's kind of a superhero, and kind of a spy, and kind of a comedian. First I nodded in appreciation at his cleverness, then I chuckled, then I finally hooted out loud. Hooray for Hoot Owl! Cute lil' book with pretty illustrations that are simple and colors that compliment them perfectly. A silly story of an owl that's trying to disguise himself in order to "catch" dinner. Illustrations are reminiscent of Bryon Barton. There is so much that I adore about this little picturebook. I like the compact, almost square size which is a little unusual in picturebooks as well as the little owl himself who's like a little painted egg with overly large eggs and a tiny, rather insignificant-looking beak. The book as a whole is near-perfect in terms of picturebook format with a mutual (and I would say respectful) balance between words and pictures. Sean Taylor is an accomplished writer and illustrates himself but I am overj There is so much that I adore about this little picturebook. I like the compact, almost square size which is a little unusual in picturebooks as well as the little owl himself who's like a little painted egg with overly large eggs and a tiny, rather insignificant-looking beak. The book as a whole is near-perfect in terms of picturebook format with a mutual (and I would say respectful) balance between words and pictures. 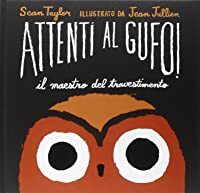 Sean Taylor is an accomplished writer and illustrates himself but I am overjoyed that it was Jean Jullien's who illustrated this book (please visit his instagram site). Neither artist or illustrator steal the limelight. Instead, there is a respected partnership. 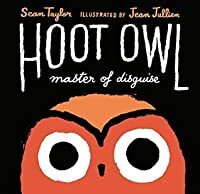 The first page introducing Hoot Owl, as he peeks from the bottom right corner of the page to warn the reader of an impending attack is humorous in itself and is an insight, perhaps, into the almost Milne-esque approach to this character. 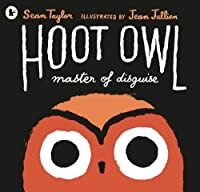 Here we have, as Hoot tells us, an owl who is known to be wise yet throughout the book, he over-complicates his methods for hunting his foes, taking an almost Looney Tunes approach to ensnaring, and failing, in the capture of his meals through various over-the-top disguises (much to the amusement of his prey). The fact that the only prey he manages to capture using his various disguises happens to be an italian-sausage-flavoured pizza only adds to the humour and joy of the story. 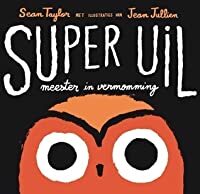 (It seems that no animals, not even Hoot Owl's self-esteem) were harmed during the making of this book. This book was super super cute. Our fourth graders loved it! A cute book with a cute twist. Any book with owls is all right by me! This is an enjoyable book. I like the irony that although Hoot Owl keeps saying that owls are wise and masters of disguise, yet owl struggles to catch any food. Hoot owl was great. He is indeed a master of disguise - his best effort being an ornamental bird bath. Genius. This review has been hidden because it contains spoilers. To view it, click here. The pictures really save this book! I enjoyed the plot twist at the end of trying to catch a pizza, however, I was not a fan of the books sentence structures and its half attempt of rhyme? the pictures, however, were beautiful and funny. I enjoy the cartoon-style and the attention to detail. This book would be great for teaching figurative language to young children as the author uses lots of similes and metaphors. There's even an example or two of alliteration. Uncommon vocabulary in this book is also a plus. Words like devise, bleak, ornamental, and transform, which you don't normally see in picture books for young children, add to its effectiveness as a teaching tool. Really liked the illustration style too. This is fun to read to a group too. Hoot Owl is hungry and disguises himself to catch his dinner. However, each of his disguises fail, and he keeps trying until he finally gets to eat...a pizza. I love the humor, repetition, and vegetarian ending. Kids learn a little bit more about owls and the plot development is spot on and engaging. The illustrations are simple and big. "Everyone knows owls are wise. But as well as being wise, I'm a master of disguise." Hilarious story about a cocky owl & his futile attempts to hunt. Bold, fun illustrations. 5 stars according to Emma. Gorgeously designed and illustrated, with thick, bold lines and vibrant colors. An owl schemes how to get its next meal in this slightly scary, mostly humorous picture book. Great for kids who like main characters with lots of bravado. I cannot stop laughing at this book, and I know my storytime kids will get a hoot out of it too. The repetition, short length, and simple illustrations pair with the hilarious story to make storytime gold. since when do owls eat lambs? but I guess this book isn't going for scientific accuracy lol. pictures are bold, story is okay, a little funny, but not enough to really make it fun. I found this book to be hysterical and really fun to read out loud! Lots of nice vocabulary as Hoot Owl hunts. Perfect for storytime, alas I have 2 year olds and it is too long. 3-5 year old storytimers rejoice. More humor than I expected from this story. Cute, funny, repeated phrasing will engage younger kids. super funny for older picture book readers! I'm really torn. I think this is a very cute book. It is fun and has a repeating theme. But it has the potential to be a bit menacing. The hungry owl keeps wanting to eat other animals, and I think that could be a little frightening for children. But, that being said, I think that if the book were read in a light-hearted fashion it would surpass the element of being menacing. Big, bold illustrations without unneeded extras.